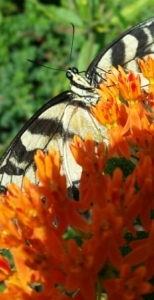 To capture the beauty of this summer’s butterflies all you need to do is learn how to think like a butterfly—and keep your cell phone handy. Its camera is surprisingly well-suited to close-up insect photography. How do butterflies think? Well, I haven’t had a conversation with one, but I’ve been studying their behavior for more than twenty years, so I can infer from their actions what they think about. Butterflies have three things in mind: Finding food. Finding mates. Finding the correct plants to lay eggs on. Butterflies use vision and smell to find the first two, and something unusual to find the third. As a photographer, your best bet is to get as close as you can to butterfly food sources. Look for clumps of blossoms of the same flower species, or a densely packed assortment of flowering plants to improve your chances of finding a subject to photograph. A mass of flowers will produce a larger scent plume, and that makes it easier for a butterfly to locate the food source. The wider swath of color helps, too. You’ll want to stand or sit within about two feet of the flowers. But as you approach the flowers, keep in mind that butterflies are extremely wary, not of humans in particular, but of birds looking for a tasty butterfly meal. A sudden shadow could be a hungry bird’s approach, so butterflies will dash away from your shadow, too. As a photographer, choose a place to stand or sit so that your shadow doesn’t trigger the butterflies’ flight response. Once you’re in position and motionless, butterflies will tend to ignore you. But birds and shadows aren’t the only problem for butterflies. Other insects and the occasional spider practice stealth hunting to catch an unwary butterfly for a meal. Robberflies and mantises sit perfectly still, absolutely motionless, amid the nearby leaves and stalks and flowers. As soon as a butterfly comes within range, they reach out and grab them. You’re going to learn to be a stealth hunter, too, as you sit or stand very close to your chosen patch of flowers. Hold your cell phone pointed toward a likely bunch of flowers and wait. Be patient. When a butterfly lands, slowly move your phone into the best position, then gently touch the camera’s shutter button and you’ll make your capture—but in digital terms only, and the butterfly will live to find a mate. As your technique improves, you’ll be able to hold your phone within a few inches of your fluttery subjects. When you’re comfortable with avoiding casting your shadow on flowers and moving ever-so-slowly, you can try hunting for butterflies far away from flowers. 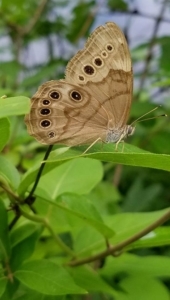 When female butterflies are ready to lay eggs, they use vision to get them in the general area of suitable plants. But to pick out exactly the right kind among plants with similarly shaped leaves, they do something quite remarkable. They “taste” them with their feet. 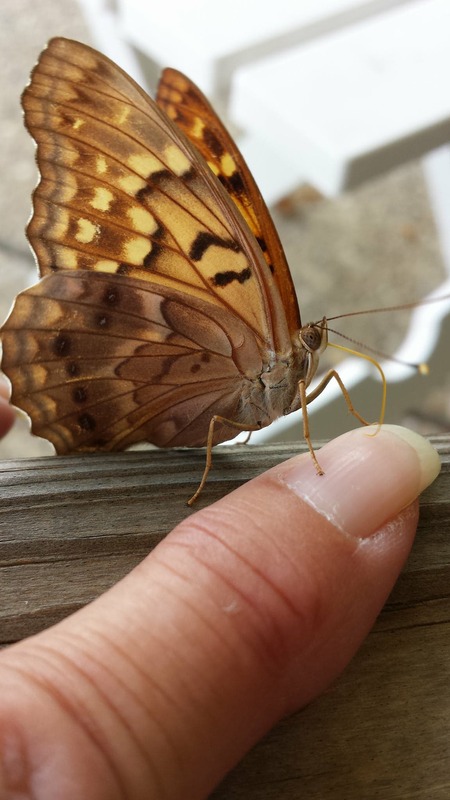 Along their tiny toes butterflies have chemical receptors similar to the taste buds on our tongues. As they walk about on leaves, when they encounter the right chemical sensations they will stop and lay an egg on the correct plant that will provide the proper food when their eggs hatch into caterpillars. 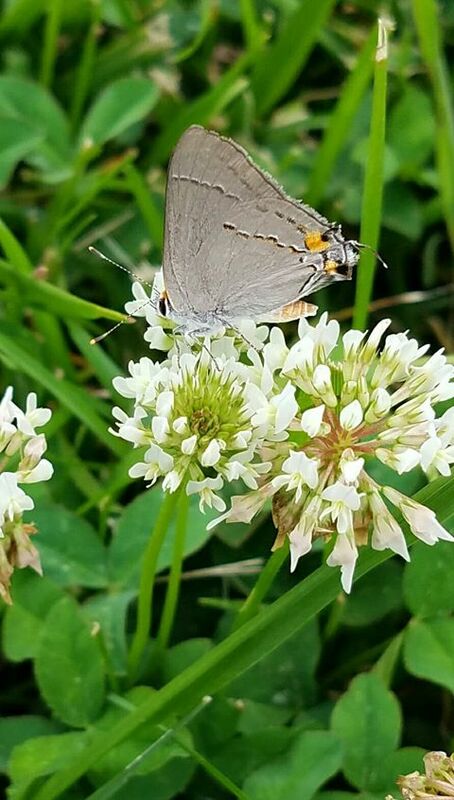 In addition to sweet nectar and host plants that “taste” right, many butterflies, especially the males, seek salt and minerals and other nutrients in damp soil, sand, or gravel. Shallow puddles just after a summer shower can be a good location to watch for butterflies to photograph. But some butterflies seek moisture elsewhere—they are quite attracted to human sweat! So when it’s hot and sticky and humid, you might get lucky and have a butterfly land on your body. This is when a cell phone is especially useful, since you can hold it in one hand and take a selfie with your new insect friend. Do not use your phone’s zoom feature when focusing on a butterfly. Take your photos at normal settings. Later, if you want to crop your image to showcase details, you can zoom in on a crisp image and still have clarity without annoying pixilation blur.